We critics love to throw around the cliched review adage “the thinking man’s (blank)” as a means of differentiating between pure entertainment and something with a bit more thought behind it. In that regard, Ridley Scott’s The Martian is a “thinking man’s Gravity,” a stranded in space sci-fi thrill ride that might not represent a true return to form, but something that definitely reminds us of its creator’s cinematic salad days. 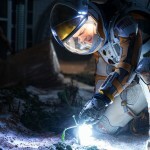 Mars replaces a space station struck by space junk, but Matt Damon is every bit as likable and cheer-worthy as Sandra Bullock and George Clooney in Alfonso Cuaron’s Oscar winner. The basic premise has the actor’s character, Mark Watney, exploring the red planet with a group of astronauts. A sandstorm separates him from the others, with his Commander (Jessica Chastain) presuming him dead. The survivors leave, putting our hero in the position of trying to contact help while finding a way off. It’s either that, or die from starvation, dehydration, and/or a lack of breathable air. Eventually, he works out most of his issues, with trying to find a way of being rescued his last item on the checklist. Back on Earth, scientist Chiwitel Ejiofor, NASA administrator Jeff Daniels, and head spokeswoman Kristin Wiig realize something is happening back on Mars and determine that, after reestablishing communication, Watney must be saved. His former crew members, including Chastain, Michael Peña, and Kate Mara, start to strategize. The Martian has more than one MVP, and oddly enough, the man behind Alien and Blade Runner is not one of them. Oh sure, Ridley Scott is right at home with this material, making it his own via his standard obsession with look and detail. This is a space mission we can believe in, fictional and yet filled with the kind of science and fact that creates a reason to believe. This is the director’s best film in years, and when you consider his recent output (The Counselor, Exodus: Gods and Kings) that’s something to really celebrate. No, the real stars here are screenwriter Drew Goddard and star Damon. The former finds a fresh and decidedly funny way of getting us to digest a whole lot of tech talk, his adaptation of Andy Weir’s novel deserving of year-end awards season whispers. He gets to the heart of the matter, giving us a character we care about and sympathize with. It’s amazing how suspenseful a movie like this becomes when we are truly invested in the outcome. Damon also delivers in that regard. He has done good work before, but he is amazing here. Unlike Interstellar, where his astronaut character felt like an afterthought, Watney is the center of this intergalactic upheaval, and we are with him every step of the way. He represents the everyman, a guy you’d like to have a beer with (or, perhaps, a pouch of Tang). With Scott banging on most of his aesthetic cylinders and a narrative that adds enough intrigue and twists, you have more than enough to move you right to the edge of your seat, and leave you there. The Martian may not have the impact of Cuaron’s 3D eye candy, but it doesn’t need to. It’s the very definition of an experience, an entertainment that outlasts its minor flaws to come across as crowd-pleasing and complex. It frequently finds the pleasure centers most film fans have forgotten they have and tickles them with undeniable appeal. Sure, it can seem slight, but there’s a lot going on here. Damon isn’t just saving himself. He’s saving the vision of every person who looked skyward and imagined what it would be like to visit other parts of the universe. Ridley Scott has given us one nail-biter of an answer. The Martian more than lives up to its “thinking man” truism.